The site incorporates a section on "prayer ideas for busy people". An order of nuns in the Irish Republic who have taken vows of chastity, poverty and obedience have launched their own website. The Poor Clares order, which is based in Galway believe embracing the internet will "help them to share an alternative perspective on life with the outside world". Sister Louis, the abbess of the order's monastery at Nuns' Island in the city said the website would offer hope "in a world overshadowed by consumerism." Sister Louis added that the Poor Clare sisters were anxious to put into effect Pope John Paul II's recent plea for monasteries to be "schools of prayer" at a time when so many people are starved of spirituality. The sisters' aim was for their new website - www.poorclares.ie - to let them take up that challenge in a manner compatible with their vocation as closed nuns. 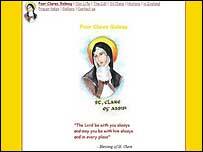 The launch of the website has coincided with the 750th anniversary of the death of their founder, St Clare. Sister Louis said they hoped that the site would encourage people to "reflect more attentively on life, looking forward to the nuns' presence on the internet being a kind of signpost to God". As well as telling the story of daily life in the monastery, the website features a history of the Poor Clares in Ireland - and also incorporates a section on "prayer ideas for busy people". The Poor Clares have maintained a low-key presence in Galway since 1642. Under the terms of their enclosure vows, the Poor Clares do not leave the precincts of their monastery without a particularly good reason. And the grille, through which they speak to visitors, is regarded as a symbol of the sisters' wish to live totally for God.